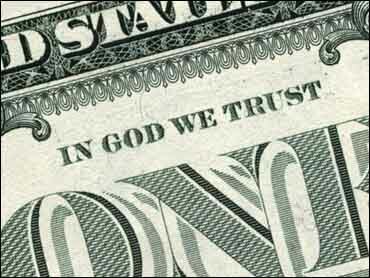 Our Currency Claims "In God We Trust." Do We? The point was made, very briefly at the end of the first message last week where we learned this definition of faith that faith must have an object. Faith is not just a mental assent to a set of facts. In the case of saving faith this is certainly true – saving faith must have an object. We all believe in something, and as demonstrated, what we believe works its way out in how we behave. When we are talking specifically about saving faith, what is the object of that faith? The only right and proper object of our faith is the Person of Jesus Christ (Galatians 2:16; Philippians 3:9). He is what we believe. He is Who we trust. He is Who we listen to and obey. He is Who we are commanded to preach. Let’s examine this claim that Jesus should be the Object of our faith. This is an easy enough proposition to prove from Scripture. In fact, there is more material supporting this claim than we can possible study in one sermon. Here are a few verses that make the point that we are to place our faith in Jesus Christ if we are to be saved. Now, observe we have called this faith true faith, and we will prove it to have been so. First, it was faith in the person of Christ. It is a great mistake to fancy that to endorse sound doctrine is the same thing as possessing saving faith, for while saving faith accepts the truth of God, it mainly concerns itself with the person and work of the Lord Jesus Christ, and its essence lies in reliance upon Jesus himself. I am not saved because I believe the Scriptures, or because I believe the doctrines of grace, but I am saved if I believe Christ; or, in other words, trust in him. Jesus is my creed. He is the truth. In the highest sense the Lord Jesus is the Word of God. To know him is life eternal. We see then that in order to be saved we must believe in Jesus. We must place our trust in Him. We cannot place our faith in Christ if we do not know Who He is! Here then is a basic introduction and reminder for us about Who this Jesus is. Jesus is identified by many names and titles in Scripture, including the Word, the Way, the Messiah, the Christ, the Son of God, the Son of Man, the Truth, Immanuel (God with us), the Savior, the Redeemer, the Lord, the Life, the Lamb of God, the Mediator between God and men, and others. Let us see what a few of these names and titles tell us about Who He is. Jesus is God. That is where we must start as we look at Who He is. Contrary to liberal and non-Trinitarian claims, Jesus absolutely identified Himself to His disciples and to the crowds to which He preached as God in human flesh. We understand that the Bible presents us with the doctrine of the Trinity, and while the word “trinity” never occurs in the Scripture we do know that it is a good word used to explain the truth that Scripture clearly presents. The One Almighty Living God exists as Three Persons: the Father, the Son, and the Holy Spirit. As such, Jesus is the Second Person of the Trinity. Anyone who claims then to believe in God but denies that Jesus is God, does not know God or believe Him. They have fashioned an idol out of their own imaginations. Therefore, the god worshipped by cults and other religions is not the God of the Bible. In God’s plan of redemption, it is Jesus who came to be born as a man through the virgin Mary. He had no earthly father in the sense of genetics or conception. God is His Father. Being born of a virgin, He has not inherited the sin nature and the curse upon all mankind descending by natural means from Adam. He is thus fully human yet without a sinful fallen nature. Jesus then is truly God in human flesh, Immanuel, God with us. He became a man in order to pay the penalty for sin. We are conceived sinners, born sinners, and will die sinners, and the wages of sin is death. So Jesus came to be a man and therefore pay sin’s penalty, death. As fully God and as fully man at the same time, Jesus is One Person but has two natures. Therefore He was tempted as we all are, yet He did not sin. This allowed Him to serve as the perfect sacrifice for our sins. He did not die for His own sin, but for ours. Since He was righteous and sinless, He gave to us His obedience while taking the penalty for our sin upon Himself. What a glorious transaction this is. We start then by understanding that the Bible plainly tells us that Jesus is God with us. By using this term to describe Himself, Jesus was saying to his audience that He was equal with God. In other words, He was God. As we have already seen the Bible establish, He is God, fully divine. He chose to limit His divinity while incarnate as a man, but is nonetheless still fully God and fully man (Philippians 2:1-11). When He used this title with a crowd on one occasion they took up stones to stone Him for blasphemy. The crime of claiming to be God was punishable by death (John 10:30-31). When He was crucified it was because the religious leaders accused Him of making Himself to be God (Matthew 26:64-66). This was Jesus’ favorite name for Himself. He used it to describe Himself more than any other name or title, using it 83 times in the Gospels. What does it mean to be the Son of Man? It is a title that only the Messiah could claim (Daniel 7:13-14). This title specifically speaks about His suffering as a man, suffering hunger and thirst, tiredness (physical needs), pain, torment, and eventually death on the cross. It speaks of how He had to humble Himself to become a man in order to be our substitute upon the cross. Jesus is Lord. We do not make Him Lord. We do not crown Him King. He is Lord. This is the plain testimony of Scripture. Jesus is Lord (master) over all of Creation. As such we are His slaves, purchased with His blood, and we owe Him perfect obedience and love and honor. At that final day, every knee will bow and every tongue will confess what is true – Jesus Christ is Lord. However, only those who confess it now, in this life, will have the hope of salvation in the life to come. The term Messiah means literally the “anointed one” and is translated as Christ in the New Testament. He is the Messiah, the one appointed and anointed to save His people. He is the One who was promised all through the Old Testament. In fact, the Old Testament points to Christ, showing us in shadows and types Who this Messiah would be and what He would accomplish. The crowd on the day of the Triumphal Entry professed that He was the Messiah, and a few days later that same crowd cried out “Crucify Him” (Luke 19:28-40; 23:18-25). Jesus as the Redeemer has paid the price to buy us for Himself. Many have stated that He paid the devil, but this is not true. If we examine the Scriptures we understand that God does not owe the devil anything. The question must be asked, what did Jesus save us from? As we have discussed here before, Jesus saved us from sin, self, death and hell – but above all, He saved us from God. Yes, it’s true. He suffered the wrath of God for our sin, wrath that we would have suffered had He not died for us, wrath that the lost man will bear for eternity if he dies without trusting Christ. Jesus redeems us, He paid the price that God’s justice, holiness and wrath demanded. He bought those who are His with His own blood and we are His forever. Jesus is our Savior. He has saved us from our sin. He has offered Himself once for all as the sacrifice that the Father’s holiness and justice demanded and He has become our Savior. In fact, as we study later why Jesus came, we will examine the fact that He came to “seek and save that which was lost.” He has saved us from sin, self, death, and judgment. We could not save ourselves, so He saved us. Jesus also is the Mediator of the New Covenant, the Covenant in His shed blood. He is the only Mediator between God and men – the only One who could stand between the two and make peace with the sacrifice of Himself. He intercedes for those for whom He has died. He Mediates the Covenant of God’s everlasting grace. Where we would have stood on our own condemned to death for our sin, He now stands as a substitute, giving His own life to atone for ours and presenting that to God the Judge, who declares us right with Him (justified) when we trust Christ to save us. Jesus is a prophet, declaring to us the Word of God as He presents Himself to us, the very living Word of God. Jesus is a priest in the order of Melchizedek, a new and everlasting High Priest who offered Himself as the supreme sacrifice for His people in order to reconcile them to God. And He is the King of Kings, the ruler of all Creation, in Whom the whole world and creation consists. He is above all and everything was created by Him for His good pleasure. The disciples referred to Jesus as “Rabbi”, a phrase which means teacher. They were His “disciples,” learners, or followers. He was the teacher. Thus He teaches us from the Word about our need for Him and our only hope of salvation. Jesus is the only Way to God. The early church in fact was known as “those of the Way.” I wish that had stuck. He is also the Truth. God cannot lie, there is no deceit in Him, He is light, pure, holy, spotless, and immutable. He is also the Life. To know Him is to have eternal life. Without Him there exists but death and judgment. With Him there is life eternal. In summary, if we deviate from what the Scriptures plainly tell us about Who Jesus is then we have misplaced our faith, believed a lie, and are deceiving ourselves. We may not understand all of these things about Who Jesus is, especially when we are new believers, but as we grow in grace and our faith matures we will not deny any of these essential parts of Who He is. One of the early church creeds explains quite clearly Who Jesus is. We will close with it today. Join us this Sunday, January 9, at 10:30 AM for worship. This week’s message, “Who Do You Trust?” is the second message in our new series from Hebrews 11.